... when you see a television listing for "Twisted Sisters" and you immediately think of Twisted Sisters Knitting, not the lady wrestling thing that it apparently is. Thanks, MSNBC, for getting my hopes up. In more exciting news, I've submitted patterns to Knitty and Twist Collective in the past month, so am keeping my "pointy sticks" crossed. If they aren't accepted, I will publish them myself. And then I have some other designs I'm working on. For now I'm taking a wee break now to knit up a special request: a Hap-style blanket (variation on Ysolda's from Whimsical Little Knits 1, doing the center panel on the diagonal) for my stepson. I'd made one for Nick for Father's Day, and Stevie wants his own. Nick's uses some of this natural, cream-colored Lopi with Manos del Uruguay in this fiery red for contrast. Stevie's uses the same Lopi (I have a LOT of it) with two strands of this gorgeous blue from Wellspring Woolens (thanks, Annie!). This Poppi's Worsted Plus is an icelandic wool from the Minnesota River area, so it's a perfect complement to the Lopi. It's all a little too itchy for me to think of having next to my skin, but Stephen is always snagging his Dad's blanket, so I know he'll like it. And it's nice to work with. Sometimes you just want some good ol' wool, you know? Darn! I thought I had some photos to share of Thursday night's book signing at Knitty City, but, having just checked (and deleted) them, my camera did a terrible job of capturing Julie Turjoman, author of Brave New Knits . I had seen an advance of the book at Purl Diva in August so was excited to meet Julie and snag my very own copy. 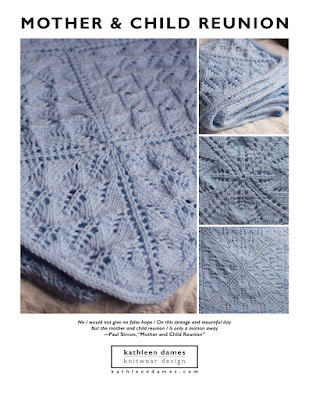 It's a book I'm really looking forward to reading, as well as to knitting some of the patterns. Happily, I ran into the Subway Knitter herself, as well as Connie Chang Chinchio, Kristen Kapur, and Melissa Wehrle, who are profiled in the book. I had hoped that Mr. Brooklyn Tweed might make his way uptown for this, but as he was announcing his new yarn line, Shelter, the next day, I guess it makes sense that he wasn't there. Still, his photographs are lovely. I know there's more to catch up on (new yarn stashed, an adjustment to the home of the stash, and a raft of other books to talk about), but this will have to suffice. Hope you had a great weekend! I love the "father-son" blankets! Now your love will be keeping them both extra warm. Sounds like you have been really busy. I'll keep my fingers crossed that your pattern submissions work in your favor. Oooh goodluck! I'm crossing my fingers for you that your patterns are accepted! Okay, what does it say that the first thing *I* thought was of the old hair band, Twisted Sister, and Dee Snyder?!?!?! ha! Good luck with your pattern submissions, I can't wait to see them!